Set along a narrow white-sand beach fronting the Gulf of Mexico, the condominium community of Sundial Beach Resort & Spa has long been one of the stalwart tennis anchors on Sanibel Island. Its 400-plus studio-to-three-bedroom condos begin along the beach and stretch inland, affording a variety of views from beach to Gulf to garden. None is far from the six newly-built HydroGrid courts, now under the direction of Erica Cossairt, a USPTA pro and nationally certified physical trainer. She has put in place a weekly roster of tennis activities, long on the social tennis and round robins that have long been a hallmark of Sundial. Into that mix she's woven Cardio tennis, various levels of junior tennis, and a scattering of clinics and drill session, drawing on her own experience of teaching in clubs and working with junior development in the Greater Ft. Myers area for the last 15 years. As I write this she's only been on site for a few months, getting to know the local players and trying to get a feel for what will work best for hotel guests. As more details coalesce, I'll post them here. The new tennis courts and pro shop notwithstanding, the resort as a whole has just come through a significant upgrade under its new ownership. That includes the addition of a state-of-the-art Fitness Center, new food outlets in the form of a Slice of Paradice pizza kitchen, Shima Japanese Steakhouse &amp; Sushi Bar, an on-site market and deli, and an enhanced main pool deck and bar. In keeping with its devotion to families, there are new kids programs as well. Otherwise, guests can look forward to new Kay Casperson Lifestyle Spa & Boutique, bicycle, kayak, and paddleboard rentals, and, of course, the shelling the island is so famous for. Travel Instructions. By Air: The nearest airport is Southwest Florida International Airport in Ft. Myers, 10 miles from the resort. 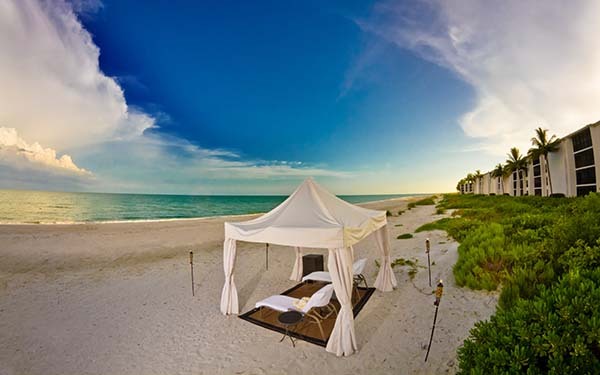 Here's what others have had to say about Sundial Beach Resort & Spa.